This month's creation was TOTALLY inspired by Debbie's "We're Quite the Pair". I absolutely adore how she used her creativity to showcase these socks in a different light. Being that this month is Valentine's I wanted to share how it is that this could be turned into an absolutely darling Valentine image. I think that the words "Sole Mate" or "We're a great pair!" would make the cutest little greeting inside the card or in the lower right corner of this card. Or hey - if you are not being all lovey, dovey you could just put "Love Stinks" on it instead - LOL! Another option being that we are in the prime of cold and flu season would be to use the awesome Lockhart sentiment "get comfy, rest and get better". 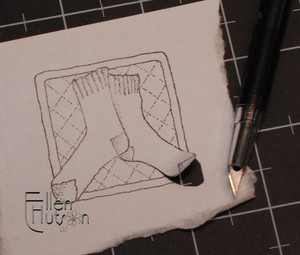 I stamped the Warm Socks image directly on the patterned paper. I colored the image using the grouping of Copics below. Just adding a hint of Warm Gray around the sock edges helped pop the image off of the background. Next I created a reverse mask for the sock exposing only the sock on the right. 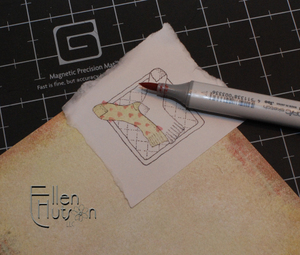 Then flip your image upside down and using the tip of your Copic Sketch Markers add the heart details. 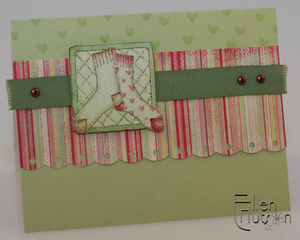 Sharon has shared the wonderful trick of creating hearts with you on her blog. I will share it with you once again here. This time I would like for you to consider some other shapes you can create using the same type of brush marker position. The brush tip when lightly "laid down" on your paper leaves a wonderful tear drop shape. When combined in fun ways you can create all sorts of different images - the biggest skill you will need to develop is the ability to place the tip of your marker in the correct position as you consider what it is that you are creating. This flower was created by layering "tear drops" in a circle. Then repeat a second time, adding a second tear drop slightly off from the first. Complete the flower by adding a yellow dot to the center. 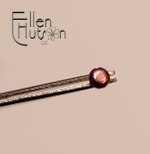 The butterfly is created by placing the tear drops and then adding the body and antennae detail with a multi-liner or the brush-tip of the Black Sketch. Add random hearts using Copic color G40 to the area at the top of the card front. To complete the card use a pair of scallop edged scissors and a hole punch or Crop-a-dile to add the eyelet effect to the scalloped edge of the striped paper. 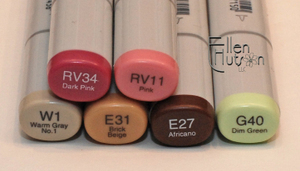 Color the silver brads with Copic Marker RV34. I use a pair of self-closing tweezers to hold my brad in place as I color it. Allow the brad to dry for a few seconds. Adhere the twill to your project and insert brads in place as shown above. At times I need to retouch the tops of the brads with a little more color after I push them in to place. What beautiful coloring! I love the color combo and the layout! This is so cute!! Once again, thank you for sharing your wonderful gift with us. Your coloring and ability to mix all of the elements never ceases to amaze me!!! Fabulous, wonderful job. TFS. 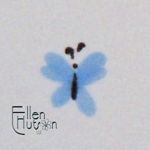 LOVE those flowers you created, Ellen -- will definitely have to try that! 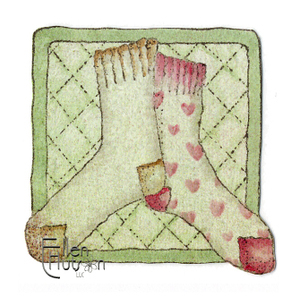 Your tiny hearts are adorable on the socks, too! Ellen... I tried the little brush technique to make the hearts and it looks so cute! Thanks for another great tip! Your card is so cozy, and beautiful! Thanks for all the details! WOW, you color beautifully! I wanna be like you when I grow up! Thanks for always isnpiring me! I must tell you that I placed an order last week, and, talk about instant gratification, my order arrived so quickly I was amazed. I can't wait to save some $$ so I can place another order. Second, your sock image came with the order. It is FANTASTIC. I cannot believe that someone actually colored it with markers. All those admiring your work on the internet are losing out by not seeing it IRL. The card you made with the image is beautiful. I love the colors and the twill accent.